Vogue Knitting Live in Chicago, November 1rst -3rd, 2013, now has classes up for registration. I am on the schedule for Sunday only!!! Click here to check out the classes for VK Live in Chicago! I have just completed another sample for my next shawl design. I am working with a very unique yarn company called Infinite Twist and the shawl is going to initially be available in kit form only from Infinite Twist for a few months and then the shawl pattern will be released on my Ravelry Pattern Shop for download. I'll keep you posted as we get closer to the release date. And yes, Infinite Twist yarns are all handspun in case you are wondering. This yarn is 100% wool, worsted weight, in the Iris Garden colorway. What a treat. In the meantime, I created four new video tutorials on how I block my shawl using straight blocking wires, flexible blocking wires and blocking pins. 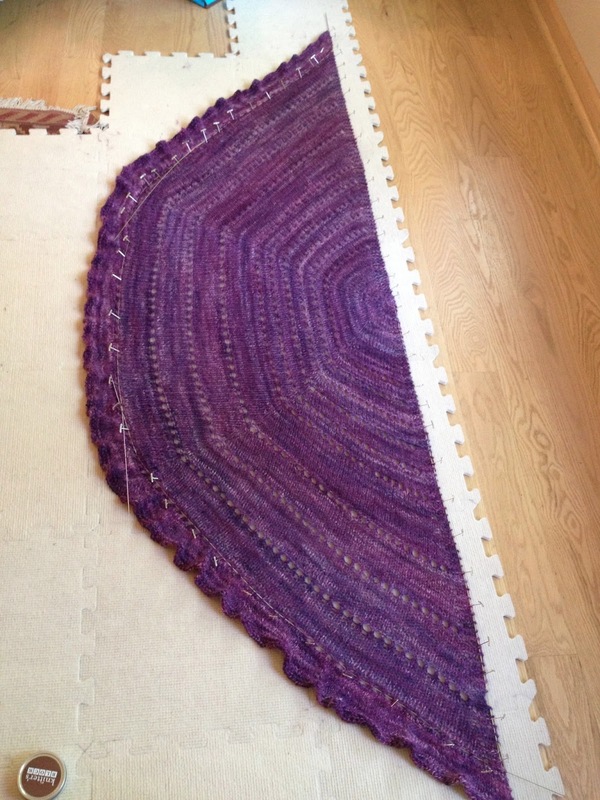 I block my shawls on blocking boards that are spread out on the living room floor. I have a big table I could use but I also have a big family that is always using this table. It is easier for me to just block on the floor and leave it put until the item is dry. The shawl is such a beauty in the handspun yarn and what fun to knit. I'll tell you more details very soon. I use Knitter's Block blocking boards and Inspiknitty flexible blocking wires. The videos are filmed in four parts. Click here to watch the videos on my YouTube Channel! Enjoy the rest of the videos below! I always learn a lot from your videos. Thank you for taking the time to post them. Very cute videos! Thanks for explaining how to use the wires. I'm going to have to order some of those. Can't wait to see a picture of the shawl once it's done drying. The yarn is gorgeous! Oh, my! Another pattern I must knit! I love that shape best in a shawl. This is a great idea, although my dog would eat anything I blocked on the floor! great tutorial! I should have an easier time now that I have wires and know how to use them. now if only a fairy knitmother could drop off those blocking boards! I'm sure my carpet (and kids) will appreciate that.